In the next census of 1911 the family still lived at Trimley Hall. Arthur Youd was 47 and still farming. His wife of 6 years was listed as Annie Youd aged 50. The listed ‘children’ in the household were John Youd 20 a Wagoner, Sarah Ann Youd 17 was a Dairy Maid and William A Youd 16 was Working on the Farm. UK Soldiers Who died in the Great War 1914-19 accessible on www.ancestry.co.uk confirms all the military details at the top of this page and adds that he enlisted in Caergwrle and that he Died of Wounds ‘at home’. His Medal index card also on Ancestry lists his three medals and tells us that his first theatre of war was France and he entered it on the 2nd December 1915. 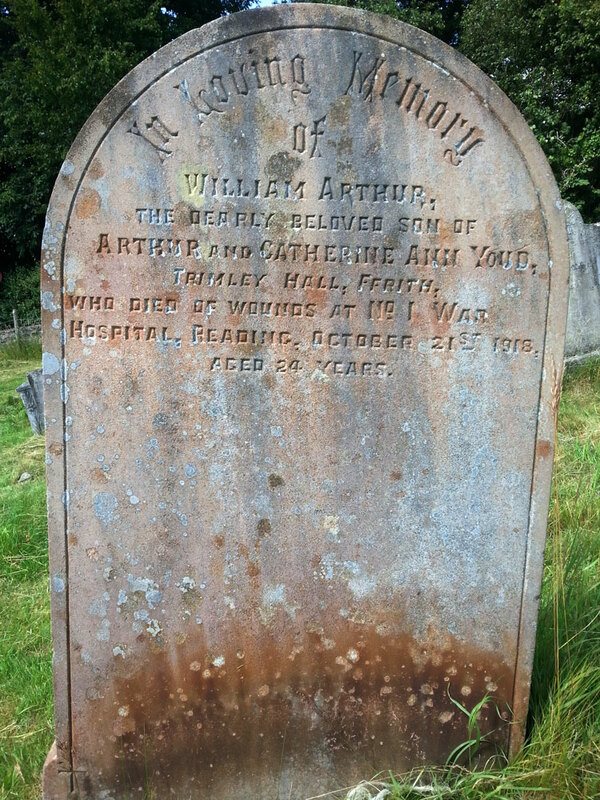 William Arthur Youd was buried in his local churchyard in Llanfynydd. His gravestone tells the last part of his story.